Easy File Locker is a protection software that can lock any file or folder on the hard disc. It is very light and use little RAM. Locking: an option allows to add all files one wants to protect. This application support the Batch mode, thus, it is possible to import many files. Once all the files are gathered in the interface, one only needs to click the "play" button to activate the protection. 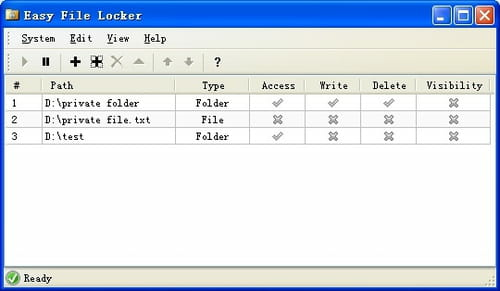 Protection mode: the advantage of Easy File Locker is that it provides many options to lock the files. It is possible to prevent a file from opening, copy, modification, or even from deletion. These parameters can be saved and restored every time windows is started. Hiding: what makes the application different from others is that it can be used to hide files. This way, even if the user search through windows explorer, or prompt, the files will not show off. Passwords: to unlock the protection, one only needs to enter the correct code. The application allows the administrator to change the password at any time. Latest update on May 31, 2015 at 04:13 PM.